In fact, that’s not the end to this quasi-madness as on Monday 26th January I’ll be on The Riverside Show on STV Glasgow telling my story of pie. It’s a 7pm kick off, so if you’re reading this before it goes out live then why not have a swatch, it’s bound to be noteworthy. If you’ve missed it, then you might get lucky if you scout about the STV Player. Given my media exploits over the past week I’ve not really had time to let anything in the world of football really grind my gears, although if you’re into that kind of thing then I highly recommend The A-Z of Football Hates by Richard Foster it pretty much hits the nail on the head in every possible way. If I’m lucky I might get some input in a second edition. But for now let’s focus on the pastry. Today a visit to the home of my first football memories, Hampden Park, and a chance to watch every romantics favourite team, Queens Park, playing for the sake of playing since 1967. So without much further ado, let’s rate some pie! 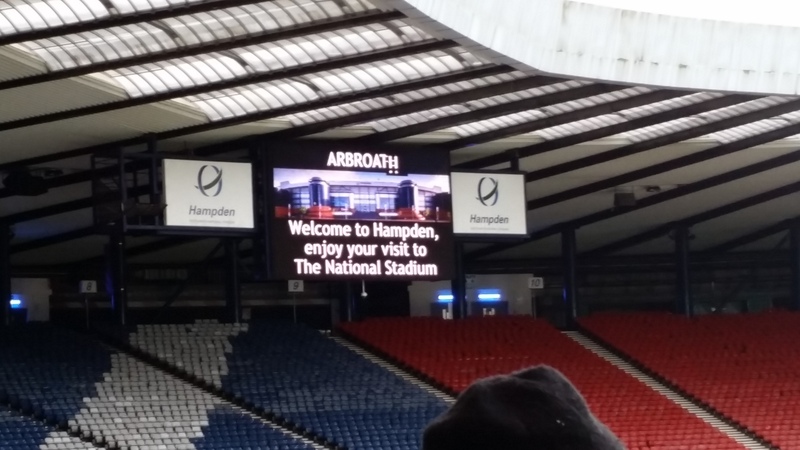 It finished 2-1 to Queen’s Park, but the Arbroath goal was so late they didn’t bother updating the scoreboard so you have this shot instead. Price: Get ready for this. A whopping £3.20. Equivalent to 3 junior pies in some cases and a massive jump in price when compared with the Spiders League Two rivals. 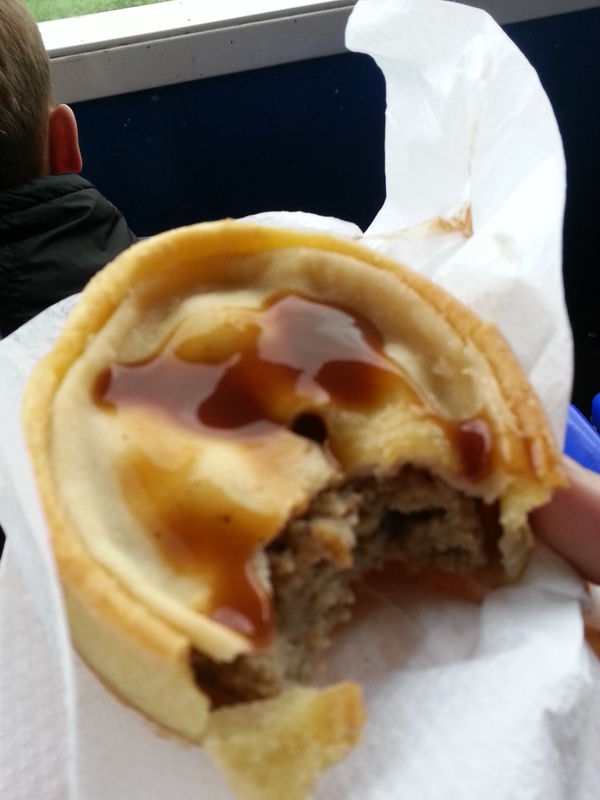 Now the thing is I have reviewed pies from Hampden before during my Tartan Army visits and so I spent a wee while debating whether to dub this another Hampden Pie, but as my mantra for this project is just as much about the teams I visit as it is the humble pie Queens Park get a shout out on this occasion. I have no doubt in my mind that if this wasn’t a Hampden this pie wouldn’t be £3.20. It doesn’t make it right but it does, in part, give an explanation. Presentation: The pie was placed in a heat retaining tin foil case with a small(ish) white napkin for after consumption dabbing. On a sub-zero Saturday I was grateful for the retained heat. Meatiness: I was looking forward to this pie, partly because its always good for the cholesterol to see a chicken pie on offer and partly because I reckon my Chicken, Bacon and Tarragon Pie is the best in my repertoire. I’ve always loved that slight aniseed kick that the tarragon gives. 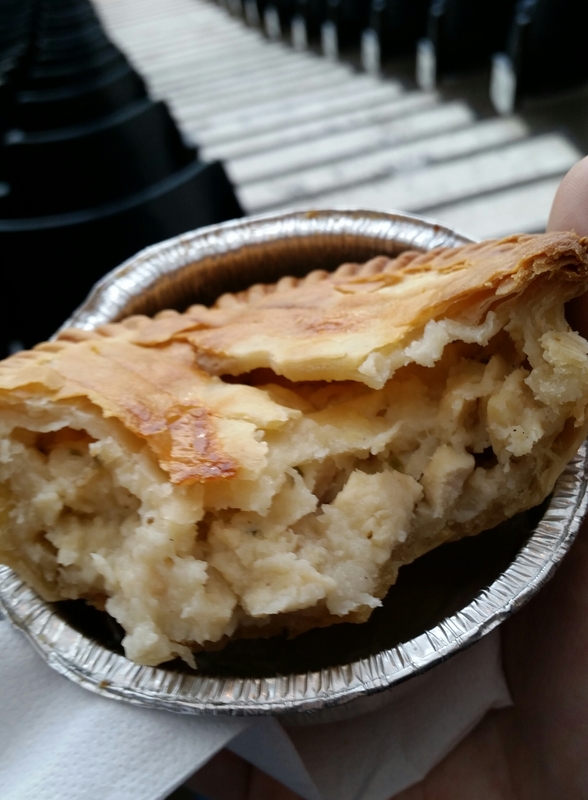 Sadly I found this pie pretty disappointing, Firstly as I made my way through it I felt no pop of chicken flavour in my mouth, in fact I was so concerned about the lack of flavour I had to tilt my head back to have a look for the meat inside. It was there but it’s flavour remained weak. The gravy wasn’t as unctuous as you would expect but more like an underdone roux and if I’m being honest at some points I felt I was eating a frangipane such was it’s sweetness. There would be the occasional burst of tarragon but its presence was oh-so fleeting. I applaud the courage of the folk at Hampden for diversifying their pie menu but I think in this instance it needs a lot of work, perhaps my judgement was clouded by own attempts at making such a pastry. The filling wasn’t unpleasant but I wouldn’t be in a rush to have another one. Pastry: Without doubt the pastry was the best part of this pie in that it was golden and flaky. It didn’t have a soggy bottom and stayed strong under the pressure of even the most greedy of bites. It was a solid foundation to a pie. Overall: A bit off the mark but should be commended for being something different, I really do think a salty hit of bacon would lift the flavour of this pie exponentially. It’s also worth noting that the price may be a stumbling block for some. Gravy Factor: Not quite ready gravy. A little more seasoning and some time spent on creating an unctuous mouth feel could have this pie on the path to pastry superstardom. It’s always tough to write a review for a pie that doesn’t quite hit the mark, and this review should not be taken as an indication that the Hampden scotch and steak offerings are not up to par as previous reviews have shown these more than make the grade. The plan was to do a Glasgow Warriors Pie but a couple of pints of Best soon put that idea to rest. Next up we return to the juniors and a pie from Central League side Rossvale. However, until then, go forth and eat pie! Oh, and tune in tomorrow, it may be the only chance you’ll ever get to see my face. This entry was posted in Football Pies, Professional Pies, Sporting Pies, The Life of Pie, Uncategorized and tagged a-z of football hates, arbroath, chicken, fitbaw, Football, Gravy, hampden, league two, Meat, pastry, Pie, queens park, rossvale, scottish football, stv, stv glasgow, tarragon, warriors. But that’s not a Pie! Hello and welcome to Meat Filled Pastries, all about the pastry of all pastries the humble pie. This latest review comes from The Scottish Cup Final at Celtic Park between St. Johnstone and Dundee United and as you may have already noticed I have had a camera related mishap when it comes to the capturing the one bite expose that graces every review I do. Put simply I haven’t saved it. I took it. I know I did because I remember looking at the picture and thinking what a tiny looking bite I had taken but alas as I went to upload it there was no picture to be found. That however doesn’t mean there will be no pie review. I ate a pie and you need to hear about it so instead of a pie glistening in the sun you have my view from the stands as Dave Mackay lifted the trophy for the first time in St. Johnstone’s 130 year history. The other thing to make you aware of is that I have broken my own rules by not having a simple scotch pie on my first visit to Celtic Park since this blog has started. Instead as a fitting tribute to the celebratory feel that the cup final provided I dived head first into the luxury market safe in the knowledge that I will return to Celtic Park soon as a member of the Tartan Army. So it’s a luxury steak and ale offering this time round, so without much further ado, let’s rate some pie! Price: At £2.90 this pie certainly had a price that matched its luxury status with only Pie: 36, The Hampden Curry Pie, being more expensive on my journey so far. There was an option to combine as part of a meal deal which would save you 10p or so overall but I ignored this option. Even with a potential 10p deduction this pie had some pricey expectations to meat, and yes I am aware I’ve spelt ‘meet’ wrong but sometimes a pie pun is too good to miss. Moving on…. Presentation: Before I actually get to the pie itself I feel I should let you know how this pie arrived in my paw. Whilst standing in a queue that was clearly going nowhere fast I noticed a refreshment hut solely devoted to pies. I booming love this idea as I approached the counter there was no queue and I was served straight away. Obviously I was delighted to have my hands on some hot pie but saddened that the chips, burgers, hot dogs and even pizzas (which looked rotten by the way) brigade continue to force their way into the football snacking market. It wasn’t just that though there was also indian and mexican food stands each offering their own alternatives to our grizzly pie faced veteran. Some will say variety is the spice of life and, in general, I wholeheartedly agree with that statement but a football ground is not where you should experience your first taste of cuisines from around the world, it was all just a bit annoying. As for the pie itself it was presented in a tin foil case with a slightly larger than normal napkin, pretty standard although I couldn’t hep but notice the sheer size of it and suddenly £2.90 didn’t seem too bad at all. Meatiness: Recently I have found the steak pies I have been offered have shied away from the tender meaty chunks approach of pie preferring a texture closer to the cheaper scotch pie equivalents, on this occasion however I am happy to report the return of the meaty chunks. It’s these chunks of pull apart tender steak that really make these pies worthy of the luxury name. There can be no debate about the fact you are eating meat and it means the gravy, that was well seasoned with a lovely malty background taste from the ale, can truly wrap itself around the chunks and be assessed independently in its own right as i have jsut done. This was a really tasty pie and as I have alluded to earlier the filling inside was generous to the extreme, this was no four bite wonder but a full ten minutes of happily nibbling away. Pastry: The pastry was a classic puff all the way round with the top hanging over the edges of the tin foil case in which it resided. This however caused a problem with the lid coming clean off after a couple of bites, something which I will do if a pie is presented to me on a plate but not the most convenient of things when standing in a football ground. Luckily my years of pie eating experience meant that I could strategically place each bite so that by the end I was left with only a small mound of meat to scoop up with my fingers. The pastry was lovely although a few knobs of butter short of being truly great but given the volume of the meat it provided a well judged counter to the richness within. This pastry was far more than a receptacle for the meat inside. Overall: I really liked this pie, especially the additional of ale in the gravy. The malty notes it gives when mixed with the chunks of gravy are a taste sensation that all pie lovers should at least get to try once. It was huge and although still a bit pricey by the time I finished eating I certainly didn’t feel short-changed. The top was loose but what was inside more than made up for it, maybe not quite the best ‘Steak & Ale’ pie I’ve had but as an overall package I would certainly have it again. Gravy Factor: Chunky Ale Gravy! Yum! A pie certainly worthy of a cup final, my next review, alcohol intake permitting, will be from Craven Cottage as Scotland take on Nigeria. I’m disappointed that the Michael Jackson statue will not be there to pose beside but a Tartan Army trip away is always an adventure not to be missed. However until nest time, go forth, and eat pie! This entry was posted in But That's Not a Pie!, Football Pies, Luxury Pies, Professional Pies, Sporting Pies, The Life of Pie, Uncategorized and tagged celtic, craven cottage, dundee united, fitbaw, Football, fulham, Gravy, Meat, mince, nigeria, pastry, puff, scotland, scottish cup, st johnstone, steak, tartan army.